Health care advocates ARE housing advocates. Quality affordable housing can be a “vaccine” which prevents long-term health problems and promotes healthy, productive lives. We all want a good, affordable home in a strong neighborhood. Good housing is good health. But when a family’s housing situation is unaffordable and unstable, chances to lead a healthy life dwindle rapidly. Source: Joint Center for Housing Studies, Harvard University, 2013. Behind on rent is associated with increased risk of fair/poor child health and hospitalizations compared to stably housed children (Sandel et al., 2018). Young children who move frequently are at increased risk of fair/poor child health, developmental delays, and being underweight for their age compared to peers in families living in stable homes. (Cutts et al., 2015). Residential instability during childhood is associated with lack of established, regular preventative and sick care and adverse physical and mental health. (Fowler, 1993). Low income children living in substandard housing are more at risk for asthma and hospitalization (Wu & Takaro, 2007). “Housing instability and homelessness have been linked to an increased risk of depression and mental illness for adults and children over their lifetimes (Gilman & Kawachi et al., 2003; Children’s HealthWatch, 2011).” Quoted from NLIHC, A Place to Call Home. Housing assistance has been linked to positive health outcomes for children. Children in families with housing assistance have lower blood lead levels compared to similar children in families without assistance (Ahrens et al., 2016). Housing instability during childhood has long-run impacts into adulthood. Adults who moved frequently as children are more likely to report being in poor mental health, including depression and anxiety, and have higher rates of smoking compared to adults who lived in stable homes as children (Bures, 2003) (Dong et al., 2005) (Burgard et al., 2012). Adults who are unable to afford rent are more likely to report smoking, be in fair or poor health, have mental distress including depression, delay doctor visits, and lack enough sleep compared to those who never or rarely worry about affording housing expenses (Stahre et al., 2015). Low-income adults receiving housing assistance are more likely to report better health outcomes and psychological well-being compared to individuals on waitlists for housing assistance (Fenelon et al., 2017). Older adults who are housed after experiencing homelessness report fewer depressive symptoms and less acute care utilization (Brown et al., 2015). 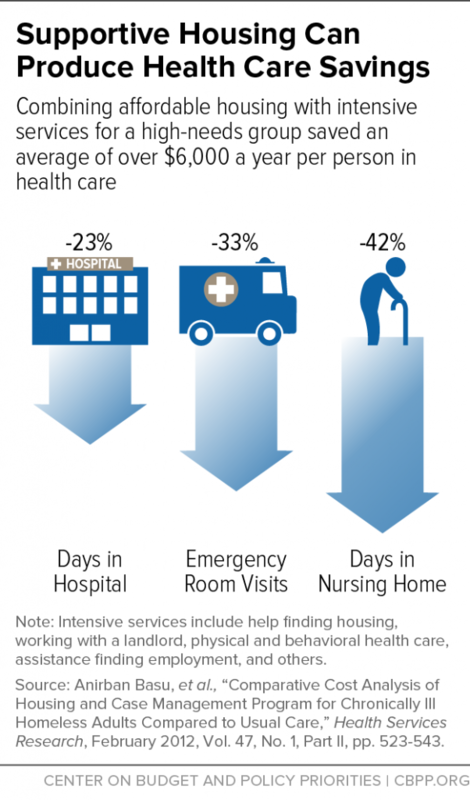 Children’s HealthWatch estimates $111 billion in avoidable health costs over ten years because of housing instability. “A landmark study found that a homeless, mentally ill person on the streets of New York City costs taxpayers $40,451 a year. Supportive housing reduces these annual costs by a net $16,282 per housing unit (Culhane, 2002).” Quoted from NLIHC, A Place to Call Home.